Lavender, lilac, hyacinth, pear, and orange collide in irresistible harmony within the pure, natural wax of our exclusive Black Magic candle. These heady floral scents have been carefully paired to guarantee bold aroma, infusing your home with an intriguing blend that’s as romantic as it is evocative. The soothing scents of lavender and lilac work to tame the citrus twist of orange and the intense floral notes of honeysuckle and hyacinth. Lavender, in particular, helps to make Black Magic one of our most intensely soothing candles – its timeless fragrance underpinning the complete bouquet, and complemented wonderfully by the soft scent of fresh, delicate lilac. Fragrant excitement comes by way of honeysuckle and hyacinth, whose distinct floral notes sit in contrast to the softer, subtle scents of lilac and lavender – for a bright and balanced aroma. Hyacinth is recognised as one of the world’s sweetest floral fragrances, and it’s this which gifts Black Magic such complexity and intrigue. The final ingredient within our pure wax Black Magic candle is orange, which serves to elevate the scent, adding freshness and zing. With its invigorating and sharp fragrance, orange is one of the world’s greatest natural stress relievers, helping to focus the mind. This, combined with the soothing scents of lavender and lilac, helps to promote a sense of calm and wellbeing throughout your home. 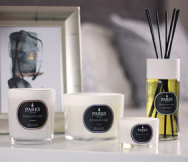 Complete with a luxury presentation gift box and with up to 50 hours burn time, the Lavender Lilac Black Magic from Parks provides the perfect gift for the discerning candle lover.